Will the arrival of light rail destroy the reason people live here in the first place? This is a photo by West Seattle photographer, Kevin Freitas. He took this as part of his submittal to Sound Transit during the scoping period. 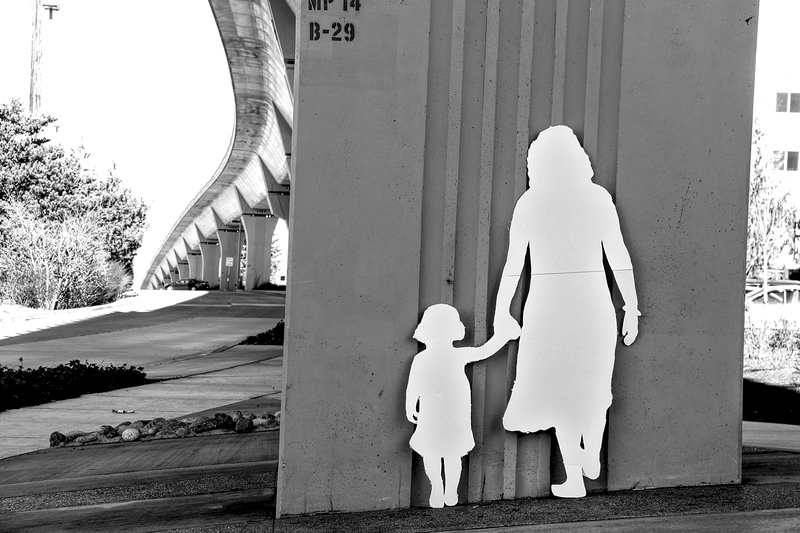 His idea was to use a life size cutout of everyday people against the brutal landscape of concrete. It tells an inquisitive story of how the concrete jungle will interact with the community. Light rail will open its doors in West Seattle by 2030, barring any delays or serious cost overruns. Although that’s 11 years away, Sound Transit (ST), residents and businesses are in the process of planning the details now. Recently, ST unveiled that a tunnel option – the option that most residents and businesses have preferred over the past year – would cost roughly $700 million more than elevated tracks. At the West Seattle Junction Neighborhood Organization (JuNO) meeting on Monday, where ST gave an updated presentation on the ongoing plans, people were angry. Although nothing has been decided – public comments are still being received, environmental impact studies still need to be done, and ST won’t decide on the preferred alternatives until later this year – the packed room of people expressed frustration. Amanda Sawyer, director of JuNO, said an elevated rail would hurt the neighborhood. Businesses and residents would suffer, she said. “An elevated rail structure would cause unquantifiable costs by destroying homes, hurting businesses, visitors and residents, and consuming valuable land with track instead of multi-family housing,” she stated. Deb Barker, board member of the West Seattle Transportation Coalition (WSTC), said an elevated rail would “destroy” the neighborhood. However, ST made clear that nothing has been finalized, and the process is still ongoing. Much more work still needs to be done before any decisions are made, she said. Furthermore, Reason said that some of the accusatory comments claiming that West Seattle is being treated differently than other neighborhoods have been based off false information. For instance, people claimed that West Seattle is the only area where ST is considering putting rail through a residential community, which is not true. “There are certainly examples of rail going through dense, residential neighborhoods, such as Beacon Hill,” she said. Chas Redmond, board member at WSTC explained the history of the current tunnel-rail debate. That new understanding changed people’s opinions. However, since a tunnel costs $700 million or more in unsecured funds, ST is a little at loss. “Doing [the project] right may mean we have to create a special levy district for West Seattle, and that question has not yet been pondered or answered,” he said. “An underground station is [the option] most of the residents in West Seattle have expressed they support, and it’s certainly the option the business community organizations support,” he said. At the end of the day, Redmond said this is a complicated issue and there are no easy answers. “We are all going to have to await the next decision point from the ST board and the stakeholder groups,” he said. The scoping period is still underway -- submit comments to Sound Transit by Tuesday, April 2, 2019. This is the last opportunity for the community to weigh in on route and station placement, as well as what ST should study in the Environmental Impact Statement (EIS). Via Email: Send your comments to wsbscopingcomments@soundtransit.org. Postal Mail: Mail your comments to West Seattle and Ballard Link Extensions, c/o Lauren Swift, Sound Transit, 401 S. Jackson St., Seattle, WA 98104. Elevated tracks do nothing to destroy a community. In fact, they strengthen them. Passengers, including visitors to the area are able to ride the trains, and see for themselves, the kinds of community gems along the train route. This may include parks and recreation options, and attractive community businesses that will get visitors and people unfamiliar to the area to open their wallets. It's exactly what I do when I visit New York and I'm trying to choose where to eat. Speaking of New York, residents of some communities are still lamenting the loss of certain elevated lines, a loss that happened decades ago. And nobody's complaining in Chicago, Philadelphia, Baltimore, or Washington DC. Sure, the trains can be loud, but what the NIMBYs are forgetting is that that the loud sound of a passing el train is more like an audio confirmation that the area's economic future remains bright. We can't let a few NIMBYs who don't like noise derail (pun intended) the Seattle area's bright economic future. Those NIMBYs can go live in the woods, where it's quiet. Urban areas are supposed to be full of life. And noise. And stuff to see.